“Pilgrims” are people who make a journey for religious reasons. But for Americans the word has a special meaning. To them it means a small group of English men and women who sailed across the Atlantic Ocean in the year 1620. The group’s members came to be called the Pilgrims because they went to America to find religious freedom. Sometimes Americans call them the Pilgrim Fathers. This is because they see them as the most important of the founders of the future United States of America. The Europe that the Pilgrims left behind them was torn by religious quarrels. For more than a thousand years Roman Catholic Christianity had been the religion of most of its people. By the sixteenth century, however, some Europeans had begun to doubt the teachings of the Catholic Church. They were also growing angry at the wealth and worldly pride of its leaders. Early in the century a German monk named Martin Luther quarreled with these leaders. He claimed that individual human beings did not need the Pope or the priests of the Catholic Church to enable them to speak to God. A few years later a French lawyer named John Calvin put forward similar ideas. Calvin claimed that each individual was directly and personally responsible to God. Because they protested against the teachings and customs of the Catholic Church, religious reformers like Luther and Calvin were called “Protestants.” Their ideas spread quickly through northern Europe. Few’ people believed in religious toleration at this time. In most countries people were expected to have the same religion as their ruler. This was the case in England. In the 1530s the English king. Henry VIII, formed a national church with himself as its head. In the later years of the sixteenth century many English people believed that this Church of England was still too much like the Catholic Church. They disliked the power of its bishops. They disliked its elaborate ceremonies and the rich decorations of its churches. They also questioned many of its teachings. Such people wanted the Church of England to become more plain and simple, or “pure.” Because of this they were called Puritans. The ideas of John Calvin appealed particularly strongly to them. When James I became King of England in 1603 he warned the Puritans that he would drive them from the land if they did not accept his ideas on religion. 1 Iis bishops began fining the Puritans and putting them in prison. To escape this persecution, a small group of them left England and went to I Iolland. Holland was the only country in Europe whose government allowed religious freedom at this time. The people of I Iolland welcomed chc little group of exiles. But the Puritans never felt at home there. After much thought and much prayer they decided to move again. Some of them-thc Pilgrims-decided to go to America. О the bleeding drops of red. For you bouquets and ribbon’d wreaths – for you the shores a-crowding. The other former Confederate states shared this attitude. All their assemblies passed laws to keep blacks in an inferior position. Such laws were called “Black Codes." “Federal bayonets" might have made the blacks free, but the ruling whites intended them to remain unskilled, uneducated and landless, with no legal protection or rights of their own. Black Codes refused blacks the vote, said that they could not serve on juries, forbade them to give evidence in court against a white man. In Mississippi blacks were not allowed to buy or to rent farm land. In Louisiana they had to agree to work tor one employer for a whole year and could be imprisoned and made to do forced labor if they refused. With no land, no money and no protection from the law, it was almost as if blacks were still slaves. his grief at the death of the President by writing this poem. The “fearful trip” in the opening line is the Civil War, the “Captain” is Abraham Lincoln, the “ship” is the United States and the “prize” is peace and national unity. My Captain does nor answer, his lips arc pale and still. My father docs not feel my arm, he has no pulse nor will. The feelings of the Chicago Tribune were shared by many members of the United States Congress. A group there called Radical Republicans believed that the most important reason for fighting the Civil War had been to free the blacks. Having won the war, they were determined that neither they nor the blacks were now going to be cheated. They said that Presidentjohnson was treating the defeated white southerners too kindly and that the southerners were taking advantage of this. “They have not been punished as they deserve, ’ said one Radical Republican. In July 1866, despite opposition from the President, Congress passed a Civil Rights Act. It also set up an organization called the Freednien’s Bureau. Both these measures were intended to ensure that blacks in the South were not cheated of their rights. Congress then introduced the 14th Amendment to the Constitution. The 14th Amendment gave blacks full rights of citizenship, including the right to vote. All the former Confederate states except Tennessee refused to accept the 14th Amendment. In March 1867, Congress replied by passing the Reconstruction Act. This dismissed the white governments of the southern states and placed them ■ under military rule. They were told that they could again have elected governments when they accepted the 14th Amendment and gave all black men the vote. By 1870 all the southern states had new “Reconstruction” governments. Most were made up ofblacks, a few white southerners who were willing to work with them and white men from the North. 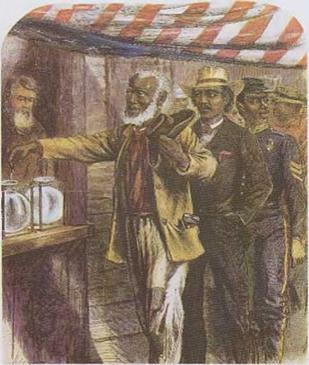 Blacks voting for the first time ttfier the 14th Amendment. The newly arrived northerners were referred to by southerners who opposed them as “carpetbaggers.” The name came from the large, cheap bags made of carpeting material in which some of the northerners carried their belongings. Any white southerners who cooperated with the carpetbaggers were referred to with contempt as “scalawags.” The word “scalawag” still means scoundrel, or rogue, in the English language today. Most white southerners supported the Democratic political party. These southern Democrats claimed that the Reconstruction governments were incompetent and dishonest. There was some truth in this claim. Many of the new black members of the state assemblies were inexperienced and poorly educated. Some carpetbaggers were thieves. In Louisiana, for example, one carpetbagger official was accused of stealing 100,000 dollars from state funds in his first year of office. Blit Reconstruction governments also contained honest men who tried to improve the South. They passed laws to provide care for orphans and the blind, to encourage new industries and the building of railroads, and to build schools for both white and black children. None of these improvements stopped southern whites from hating Reconstruction. This was not because of the incompetence or dishonesty of its governments, it was because Reconstruction aimed to give blacks the same rights that whites had. Southern whites were determined to prevent this. They organized terrorist groups to make white men the masters once more. The main aim of these groups was to threaten and frighten black people and prevent them from claiming their rights. 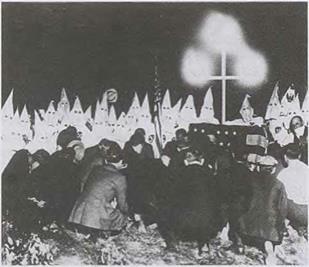 The largest and most feared terrorist group was a secret society called the Ku Klux Klan. Its members dressed themselves in white sheets and wore hoods to hide their faces. They rode by night through the southern countryside, beating and killing any blacks who cried to improve their position. Their sign was a burning wooden cross, which they placed outside the homes of their intended victims. The Kn Khix Klan in 1915.
states. When Congress withdrew federal troops from the South in 1877, white Democrats won control of these, too. Reconstruction was over. From this time onwards southern blacks were treated more and more as “second class citizens”-that is, they were not given equal treatment under the law. Most serious of all, they were robbed of their right to vote. Some southern states prevented blacks from voting by saying that only people who paid a tax on voters — a poll tax-could do so. They then made the tax so high that most blacks could not afford to pay it. If blacks did try to pay, the tax collectors often refused to take their money. “Grandfather clauses” were also widely used to prevent blacks from voting. These clauses, or rules, allowed the vote only to people whose grandfathers had been qualified to vote in 1865. Most blacks had only obtained the vote in 1866 so the grandfather clauses automatically took away their voting rights. The effects of grandfather clauses could be seen in the state of Louisiana. Before 1898 it had 164,088 white voters and 130,344 black voters. After Louisiana introduced a grandfather clause it still had 125,437 white voters, but only 5,320 black ones. in parks, m schools, in restaurants, in theaters and swimming pools —even in cemeteries! Any black who dared to break these segregation laws was likely to. end up cither in prison or dead, in the 1890s an average of 150 blacks a year were killed illegally — “lynched” — by white mobs. It seemed that the improvements the Civil War and Reconstruction had brought black people were lost for ever. In 1896 the Supreme Court announced its decision in a case called Plessy v. Ferguson. It ruled that the Constitution allowed separate facilities and services to be prov’ded for black and white people, so long as the facilities and services were of equal quality. The Plessy v. Ferguson decision made racial segre­gation a legal part of the American way of life for more than half a century. Southern states immediately began making separ­ate but unequal provision for blacks. They passed laws to enforce segregation in’ every possible aspect of life —public transportation, theaters, hotels, eating places, parks, schools. The “separate but equal” decision reached in Plessy v. Ferguson was at last overturned by another Supreme Court decision in 1954. In the case of Brown v. Topeka, the Supreme Court ruled that it was impossible for black children to receive an equal education in segregated schools. It ordered that all public schools in the United States should be opened to children of all races. This 1954 decision to abandon Plessy v. Ferguson was a landmark in the black Civil Rights move­ment of the 1950s. It marked the beginning of a campaign to end all forms of legally enforced segregation in American life. The ’ ennessee is one of the great rivers of America, к drains an area of the eastern United States almost as large as West Germany. The valley of the Tennessee was once a country of tr£e – covered slopes, but generations of farmers cut down the trees and ploughed the slopes to grow com, tobacco and cotton. All these crops were planted in the spring and harvested in the autumn. In the winter the land lay bare. Its soil was washed away by htavy winter rains. The same rains often caused floods which drove people from their homes. By 1933 the Tennessee Valley’s land was ex­hausted. It was producing poorer crops every year. The very names that the farmers gave to the countryside-Hard Labor Creeks* Long Hungry Creek, Poorbnd Valley-showed how hopeless they were. Roosevelt set up a special alphabet agency to organize help for the Tennessee Valley’s millions of people. It was called the Tennessee Valley Authority (TVA). The TVA had three main aims —to stop Hoods, to make electricity and to make the land fertile again. From 1933 onwards the valley of the Tennessee echoed to the roar of heavy machinery. Huge new steel and concrete dams rose up. When heavy rains fell the dams held back the flood water in great man-made lakes. By guiding the same water through turbines, they also made electricity. The TVA sold the electricity cheaply to farmers. The electricity was also used to power new factories making paper, aluminum, chemicals and ferti­lizers. These factories meant jobs and a better life for the Tennessee Valley’s people. 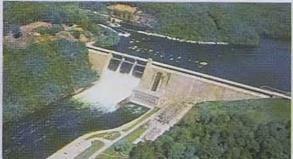 TVA also planted millions of trees and persuaded farmers to plant crops like grass and clover. These covered the ground all year round and prevented winter rains from washing away the soil. The fields and hills of the Tennessee Valley became green again as the scars of erosion were healed. One ot the ill® І111ІІ! hy the Tennessee Valley Authority. Roosevelt helped industrial workers in other ways. In 1935 he persuaded Congress to pass a law to protect their right to join labor unions. He hoped this would give workers a better chance to bargain with employers. But some big employers —Henry Ford was one – hated labor unions. They dismissed any worker who joined one. Strikes and fighting broke out in industrial areas of the country as unions struggled to win recognition. To stop the trouble another union law was passed. This was called the Wagner Act, after the man who guided it through Congress. The Wagner Act gave every worker the right to join a union, and it set up a body called the National Labor Board to protect this right. But despite New Deal reforms like these, millions of Americans still lived in fear. What ii their jobs disappeared again? Would only a breadline stand between them and starvation once more? “No,” Roosevelt told them. In 1935 he brought in a law called the Social Security Act. One part gave government pensions to people unable to provide for themselves —old people, widows and the blind, for example. Another part gave the United States its first system of unemployment insurance. The money to pay for these benefits came from special taxes paid by both workers and employers. The unemployment scheme did not cover all workers at first. But in later years more and more were protected by it. But such criticisms made little difference to Roosevelt’s popularity with the voters. To millions of Americans he was the man who had given them jobs and saved their homes and farms. In 1936 they re-elected him President by the largest majority of votes in the country’s history. As one wit put it, “Everyone was against the New Deal but the voters.” Thirty years later a New York taxi driver still remembered how many Americans felt about Roosevelt in those years. “Roosevelt?” he said in a television interview. “He was God in this country.” Even so, it was not Roosevelt’s New Deal that ended unemployment in the United States. The German dictator, Adolf 1 Iitler, did that. By 1939, despite the New Deal, ten million American workers again had no jobs. Then, in September 1939, Hitler’s armies marched into Poland. The Second World War began. The United States quickly became the main supplier of weapons to the countries fighting Hitler—what Roosevelt described as “the arsenal of democracy.” American factories began working all day and all night. The number of people without jobs fell. In 1941 the United States joined the war itself and unemployment disappeared. President Roosevelt was now too busy to give attention to further reforms at home. “Old Dr. New Deal has to be replaced by Dr. Win-the-War,” he said. His New Deal was over. Roosevelt’s efforts as “Dr. Win-chc-War” wore him out. By 1945 he was a sick man. A few weeks before the end of the war, on the morning of April 12, he suffered a stroke. Within hours he was dead. His Vice President, Harry Truman, took over as President of the United States. By this time nearly all Americans were better off than they had been in the dark days of the Depression. Some argued that this was due mainly to the coming of war. But many thought the main cause was the New Deal. People still argue about this. But there is no argument about the importance of the New Deal in other ways. The New Deal altered Americans’ ideas about the rightful work of their national government. Before the New Deal most thought of the government as a kind of policeman. It was therejust to keep order, while factory owners and businessmen got on with making the country richer. The Depression weakened this belief. Roosevelt taught Americans to look to the government to see that everyone had a fair chance to obtain what he called “the good things of life.” Many Americans still remember him with respect and affection.